getcalc.com's Covariance calculator is an online statistics & probability tool to estimate the nature of association between two random variables X & Y in probability & statistics experiments. This calculator is featured to generate the complete work with steps for any corresponding input values may helpful for grade school students to solve covaraince worksheet or homework problems or learners to know how the input values are being used in the mathematical formula. 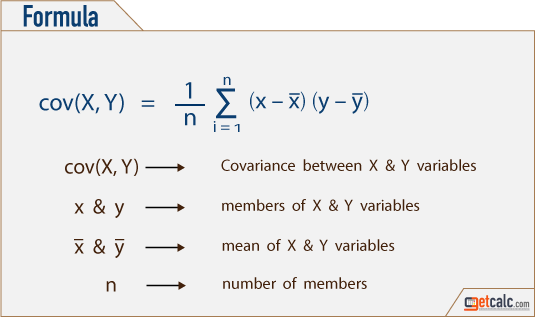 Covariance is a method to estimate the nature of association between two random variables X & Y in probability & statistics experiments. It's either a positive or negative number often denoted by cov(X, Y). The large or smaller values of both X & Y variables result the positive score of covariance while the larger values of variable X and smaller values of variable Y results the negative score of covariance. The covariance is non-linear or zero, if the two random variables are statistically independent. It's used in correlation coefficient to find the linear relationship between two random variables. Users can use this covariance calculator to estimate the linear association between X and Y or to generate the step by step estimation for any corresponding input values. In the theory of statistics & probability, the below formula is the mathematical representation to estimate the covariance between two random variables X and Y. Users may refer this below formula to know what are all the parameters are being used in the covariance formula to find the inter-relationship between two samples. Users can verify the results of such calculation by using this covariance calculator. The below are the solved examples with step by step estimation for the test of inter-dependence between two random variables (samples) X and Y. In addition to the below examples, users can generate work for covariance calculation for any corresponding input values.